Heimatec Inc. to Combine with Other Tooling Lines Under New Corporation, Platinum Tooling Technologies, Inc.
Heimatec Inc., a market leader in live tooling for the North American machine tool industry, announced today that it will become part of a new corporation, Platinum Tooling Technologies, Inc. The announcement was made by the longtime president of Heimatec, Inc., Preben Hansen, who will lead the new company as its president and COO, holding a majority stake in its ownership. 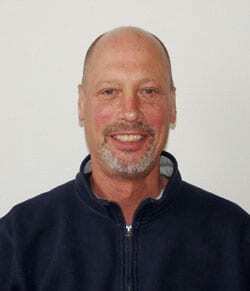 Mr. Hansen is a 30-year veteran and recognized authority in the machine tool industry for tooling and its applications. 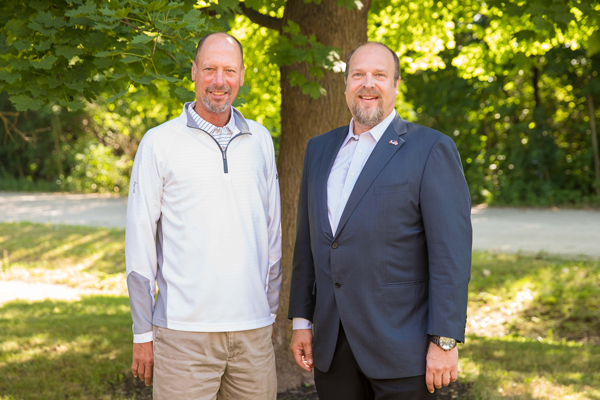 “I’d been pondering this move for some time and, after considerable discussions with Heimatec GmbH, Tecnicrafts Industries, Henninger GmbH, and other principals we represent, it seemed time to make this decision and move forward with the new company,” said Hansen, speaking from the Heimatec North American headquarters in Prospect Heights, Illinois, just outside Chicago. Hansen continues, “The new company will enable us to serve our existing and new market opportunities in a more pro-active fashion.” He cited the recent expansion of the Chicagoland facility, with added office and warehouse space, allowing more staff to be hired and greater inventories to be carried on all lines to be represented by the new company. The Heimatec products will continue to be our main focus but we are fully committed to the growth and success of Tecnicrafts and our other product lines. Other developments in the works, Hansen states, include additional lines of machine tool accessories and related machine components. Heimatec Inc. has been adding various other brand names to its roster over the years, most recently the very successful guide bushing and collet line from the global supplier Tecnicrafts Industries. 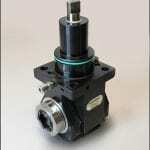 Tecnicrafts manufacture products made specifically for the Swiss machine tool market. Platinum Tooling will make a further investment to this line with extensive inventory and the purchase and installation of a grinding machine. Bringing this process “in house” will improve delivery times and strengthen market position. 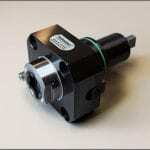 A new website has been developed for Platinum Tooling Technologies, Inc., as well, www.platinumtooling.com. Are You “Following” the Social Media Movement? Over the past few years, social media has become increasingly mainstream in our daily lives. As of September 2017, Facebook has approximately 2.07 billion monthly users according to Facebook Stats. Twitter, on the other hand, had an average of 328 million monthly users as of the first quarter of 2017 as seen in a Forbes article. Lastly, an article from Fortune claims that LinkedIn has 500 million users as of April 2017. While social media initially rose to popularity with teenagers as the main users, older generations have since adapted to these changing times and have incorporated social media into not only their personal lives but also into their professional lives. More recently, businesses have realized the immense potential of having a social media presence. No longer is social media solely for interacting with friends and playing games; today, it’s opened the doors to vast possibilities for brand recognition among businesses and consumers. In the manufacturing and industrial markets, social media can be extremely beneficial as companies in these industries rely on monthly trade publications for advertising and sharing product news with their specific audience in the hopes of generating leads. While this continues to be important to create brand awareness, social media can lend a helping hand. By using social media, a company can easily promote their brand the other 30 days out of the month. Social media is the perfect outlet to not only promote your brand and share exciting company news but to also share breaking news and relevant topics that pertain to your company’s industry. This allows your business to become a wealthy source of information and lends a great deal of credibility to your company within the industry. Among those benefits is the added bonus of being able to connect with a very specific, pinpointed target market that is already interested in your industry and therefore will be a possible lead. Communication is key when it comes to any business and marketing strategy. Social media is a medium of communication that lets a business interact with consumers in ways that companies have never been able to before. The future of social media for businesses looks bright as there are plenty of ways to reach your audience and stay relevant in the minds of the consumers. It’s important to stay up-to-date as social media and technology are constantly changing and improving. Are you “following” the social media movement? It’s about time! See what social media can do for your company. 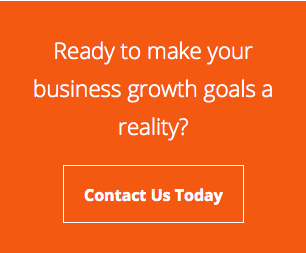 Reach out to us today for more information or with questions on how social media can have a beneficial impact on your company. We’re here to help increase your brand awareness. That’s how one of my favorite high school teachers started out many a lecture. Father Cochran taught me logic at the all-boys Catholic prep school I attended. From him, I learned Aristotle and Aquinas in Greek and Latin, plus all the modern thinking of the day. His opening set the tone, namely, encouraging us to keep all things in perspective and never forget the lessons of our youth, no matter what changed along the way. My point? In today’s ad agency, we have technologies galore that didn’t exist just 43 years ago, when I was a…fledgling copy boy at my first ad agency, writing display classified ads on a “modern” electric typewriter for the agency that handled the American Grease Stick Company, maker of products such as SqueakEase, DoorEase and LockEase. Thrilling, I can hear you say. The rubber injection molding machine making REP technology accessible to all! 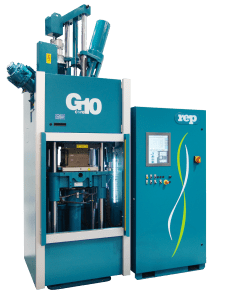 In the little world of rubber injection molding machines, the name of REP has been recognized for years as a synonym for performance and high technology. REP presses are known for being reliable, durable and adapted to the most sophisticated processes. However the drawback of such reputation is that some customers think they cannot afford REP technology or don’t need advanced features knowing well they are unnecessary for their simple parts production.The G10 Core line was designed to target these customers’ needs. Presented for the first time at the end of 2016, much less expensive than the G10 Extended, the G10 Core meets the needs of lean manufacturing, for uncomplicated and standard processes, while delivering the usual REP quality and reliability. The G10 Core is available with clamping forces from 1 600 to 5 100 kN : V410 Core, V510 Core and V710 Core. 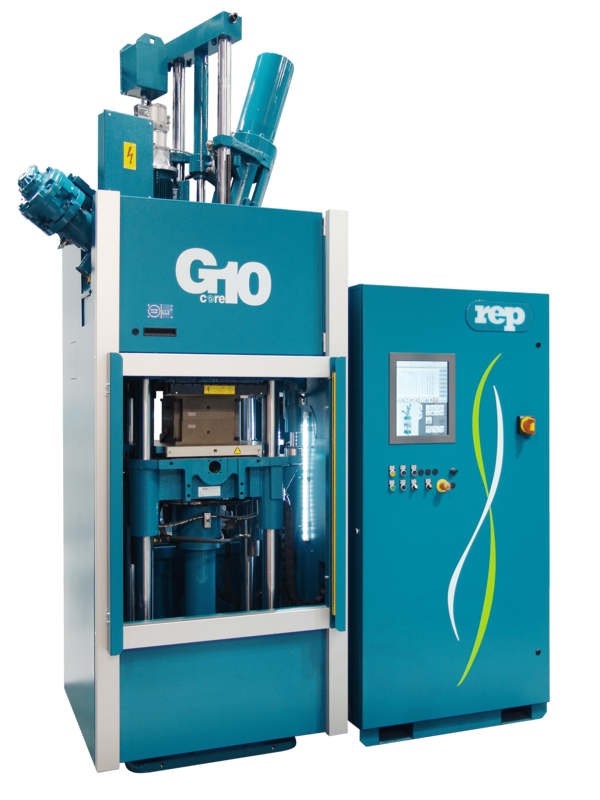 These machines feature all of the REP technology at optimized cost. The G10 Core is a G10, it has the same patented injection unit as the G10 Extended with separate injection and plasticization functions. Unlike other so-called budget machines, it is CE-certified . For customers who need simple solutions without stripping kit, process control customization or other particular features, it is the ideal solution! The demands for prototype, tool and mold making are increasing. Only those who can supply high quality output, quickly and flexibly, can succeed against the powerful competition worldwide. Zimmermann is responding to this trend with the new FZU. 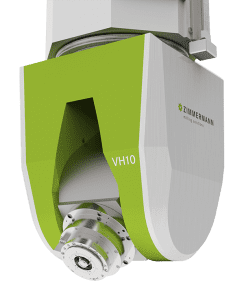 This 5-axis gantry milling machine is not only extremely compact but, thanks to its thermo-symmetrical design and accuracy, it also provides the ideal entry point to the Zimmermann machine line with maximum productivity. Plastics, casting resins such as Ureol and aluminum are particularly suitable for machining. “This development will enable us to close the gap in the lower weight class,” states Frieder Gänzle, General Manager and Partner at Zimmermann in Germany. “The basic expectations, which prototype, tool and mold makers need to meet today, have not necessarily changed over the years, they have simply grown,” sums up Frieder Gänzle. Customers in the automobile industry, he notes, especially expect components with almost perfect surface finishes and ever higher accuracies. Manufacturers introduce new models or variants to the market at ever shorter intervals. Whereas prototype, tool and mold makers could previously plan in the longer term, they must respond today to inquiries considerably faster. “We cultivate a very special relationship with prototype, tool and mold makers,” says Gänzle. “Together, we have evolved consistently in recent years. We are very appreciative of our strong business in this sector.” Zimmermann is continuously exchanging technology information with its user base. In discussions, it has become clear that this sector requires powerful, compact machines with maximum productivity and open time. And, importantly, Zimmermann must offer an attractive price/performance ratio, while meeting all these requirements. “We have evolved even further towards heavy-duty cutting, over the years,” reports Gänzle. “As a result, even the smallest machine in our portfolio, the FZ33 compact, has become more popular. We have continuously pushed it upwards from a technological point of view.” Its focus is on aluminum cutting, but steel can also be machined. This enables Zimmermann to offer customers a very efficient, flexible and space-saving machine, while the corresponding design improvements have also had an effect on the price. “The requirement we were presented was for an entry-level model which rounds off our program at the lower price point,” explains Gänzle. The result is the FZU, a 5-axis gantry milling machine which is optimized for weight and stability. With the FZU, Zimmermann is developing an extremely compact universal machine for prototype, mold and tool making with an attractive price/performance ratio. 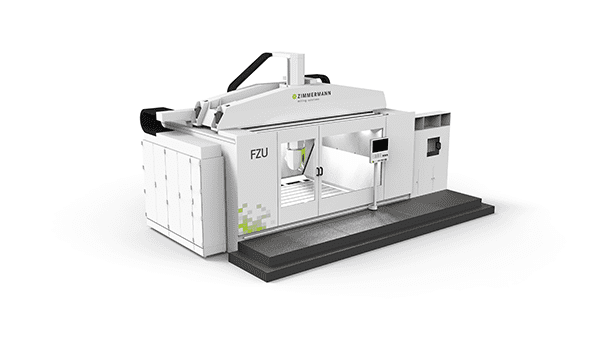 In contrast to the established FZ33 and other machines that Zimmermann offers today, the company is taking a different path with the FZU. “We can narrow down the special features of this gantry machine to three main characteristics,” describes Gänzle. The first point: “We are following the trend towards modern manufacturing machines and designing them as space-saving, pre-assembled units.” This means Zimmermann assembles the machines in-house and can then transport them to the customer by truck or ship without having to dismantle them. Onsite, they are ready for use in a very short commissioning time; erection and start-up require minimum effort. For the customer, this means quickly available machines which can be installed without constructing foundations. “In the design, we have kept to the usual transport sizes. At the same time, the new FZU achieves a remarkable working range for its size,” explains Gänzle. It is important to match the machine to the required dynamics. Adverse environmental conditions and long machine running times necessarily give rise to thermal expansion effects. In spite of the customers’ increased accuracy requirements, the machine must always achieve outstanding surface finishes. The Zimmermann engineers have therefore designed the FZU gantry machine to be thermo-symmetrical. This means that the milling spindle, guides and other accuracy-determining components are arranged so that their heating is either compensated or they can expand in uncritical directions. “This is the second important characteristic,” emphasizes Gänzle. The base frame consists of a steel welded construction which forms a continuous U-shape. The machine gantry’s centrally guided Z-slide has an octagonal section – and not a rectangular one like comparable machines – which makes it particularly stable. Thanks to its design, it therefore has impressive rigidity for its size. “With a weight of approximately 35 tons, a length of 3,500mm, width of 7,500mm and a height of just under 5,000 mm, we have been able to build a light and compact machine,” says Gänzle. 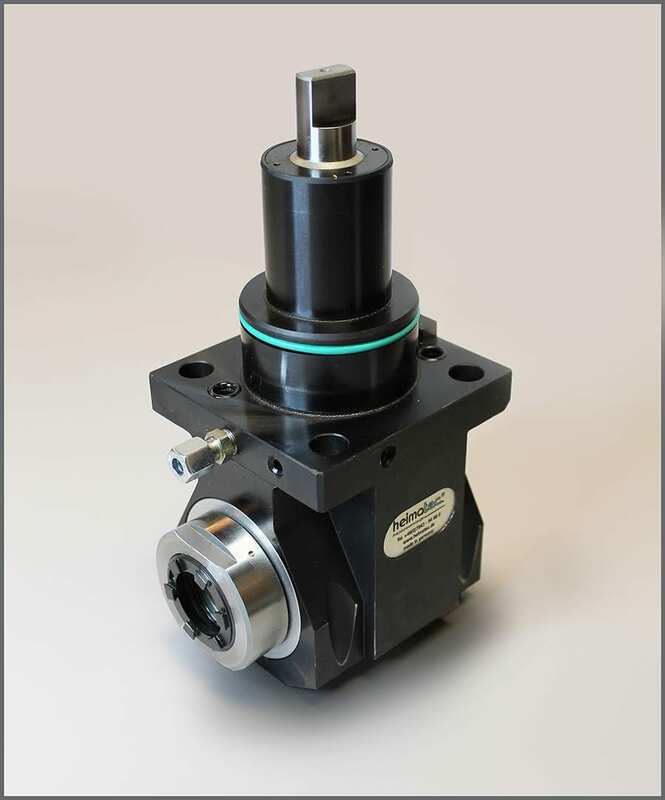 VH10 spindle head design from Zimmermann, with 34kW and 24,000 rpm standard performance in a rugged design. 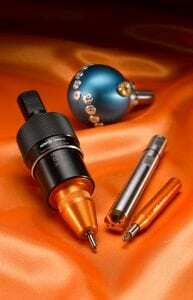 The third characteristic relates to the new VH10 milling head, which achieves an extremely high power density. “This new development has enabled us to reassess our portfolio,” reports Gänzle. This is because the VH10 head will replace the VH12, which is not a Zimmermann product. Alongside the VH20, VH30 and VH60, the VH10 is now the smallest head in the range. Users will also benefit from the fact that Zimmermann has suitable spare heads in stock and can supply them on request in the event of stoppages, for example, due to a crash. “We strive to respond quickly and provide the customer with optimum support,” emphasizes Gänzle. 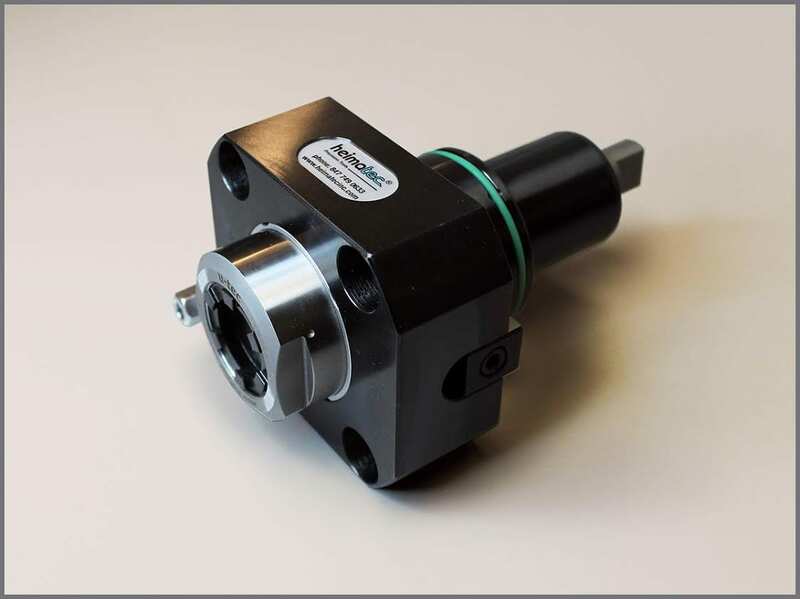 Thanks to its slender design, the VH10 spindle head has only minimal interference contours. Compared to the VH12, it achieves almost double the clamping force. This is due to the fact that Zimmermann fits two side cheeks instead of one onto the unit. The VH10 is therefore considerably more stable in operation. In order to minimize throughput times, a powerful 34 kW spindle with a maximum speed of 24,000 rpm is used in the milling head as standard. “The FZU is therefore ideally suitable for the materials typically found in this business sector, such as Ureol, clay and aluminum. In the future, we will also use the new milling head in larger machines on which processers can produce one-to-one models – for example, on our FZ37,” says Gänzle. In order to provide a high-quality machine at an attractive price, the designers at Zimmermann have turned their attention to remaining competitive with regard to price through increased component standardization, while at the same time addressing individual customer requirements. As with all machines produced, Zimmermann therefore also relies on a modular system with the FZU. Among other things, this approach enables different size variants and power levels to be produced. There are also numerous equipment options which offer the customer maximum flexibility. Zimmermann is therefore able to provide a very efficient solution with the new FZU. It is often the little things that give rise to success and customer satisfaction. “We place great importance on details – an aspect which cannot always be measured in the numbers,” explains Gänzle, who cites two examples: “For instance, the machining area is fully clad with stainless steel sheets in order to guarantee maximum resistance to abrasion. The FZU is also the first gantry milling machine to be equipped with our innovative, new NXP 24-inch multitouch controller, which is already used on our FZH horizontal machining center.” Another increasingly important topic is ergonomics. The door is divided asymmetrically to enable components to be easily fed to the machine. A small, easy-to-open door leads into the machining area, while the large door is used for loading. Operators therefore have a relatively large field of view, rapid access to the machining area and ample space for loading – ergonomic advantages which are not to be underestimated. Another detail is that a cabinet has been installed directly in front of the FZU. “This was the idea of one of our designers,” says Gänzle. “The tables, which users in the various plants position in front of the machines to place their accessories and service tools, caught his attention. With our solution, everything which is part of day-to-day operations can be safely stowed close at hand within the machine.” Added to this, there are extraction equipment and special chip management systems. “It is often the simple ideas which make the machine operator’s everyday tasks much easier,” sums up Gänzle. To provide the best possible support to businesses, Zimmermann concentrates on high-quality and reliable service in close proximity to the customer. After all, this is exactly what characterizes a good relationship between supplier and user. 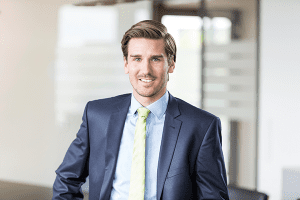 “Customers expect high availability over the entire system lifecycle,” says Gänzle. “We provide comprehensive machine care.” This includes a customer hotline, by means of which users can reach a competent contact person, even outside of normal working hours, as well as a remote diagnosis system that allows a rapid response in an emergency. If mechanical components are defective or malfunction, the machine builder usually guarantees immediate shipment from its factory. In addition, the application engineers work together with the customer to optimize each individual combination of heads, spindles, tools and clamping equipment for the machines. Zimmermann therefore not only sells machines, but also complete solutions. Plans are in process for further upgrades to the stocking and service personnel staff in North America, as well. Zimmermann recently opened a new facility in Wixom, Michigan, near Detroit. “We don’t want to be chasing trends; instead, we want to help shape the market,” says Gänzle. “Basically, we therefore aspire not to do the same things as our competitors.” To be technologically out in front, the machine builder never stands still with regards to machine development. The FZU is therefore being continuously optimized – without at the same time losing sight of the price/performance ratio. There appears to be substantial market interest in these machines, according to company research. The initial discussions with users were highly promising. “We are confident of meeting our customers’ requirements with this new development, both in Germany and internationally,” says Gänzle. The statement that the concept of the FZU could be transferred to the other machines in the program underlines how convinced he is of this new solution. Zimmermann will be presenting the machine to a specialist audience at WESTEC 2017, CMTS 2018 AMB in September, 2018. As further indication of emerging market interest, three users have already decided to purchase this new gantry milling machine. Zimmermann GmbH is headquartered in Neuhausen a.d.F., Germany, and is one of the world’s leading suppliers of high-tech milling solutions. The machines have huge working areas, tremendous dynamic performance and enormous cutting capacity. Founded in 1933 by Friedrich Zimmermann, the company now has over 200 employees, with subsidiaries in the USA and China. The innovative company has one primary goal for its range of products: being able to offer the right solution to its customers and so ensure high profitability: “Quality made in Germany”. Its specialized machines are in use throughout the world in the aerospace and automotive industries and find many special applications. Zimmermann Inc. is the North American headquarters, based in Wixom, Michigan (Detroit) and is a full-service operation with machines, application engineering, sales and service personnel on staff to serve the company’s growing markets in the U.S., Mexico and Canada. Schütte (Jackson, Michigan) today announces the appointment of Mr. Jeffrey Reinert as CEO for the North American operations of the company, effective June 8, 2017. Schütte supplies a range of multi-spindle machine tools and grinders for production work in various sectors of the metalworking market, including medical, orthopedic, tooling, contract machining and more. Jeff Reinert brings over thirty years of related experience to the position, having been involved with all aspects of manufacturing, sales, marketing and management in the machine tool industry. 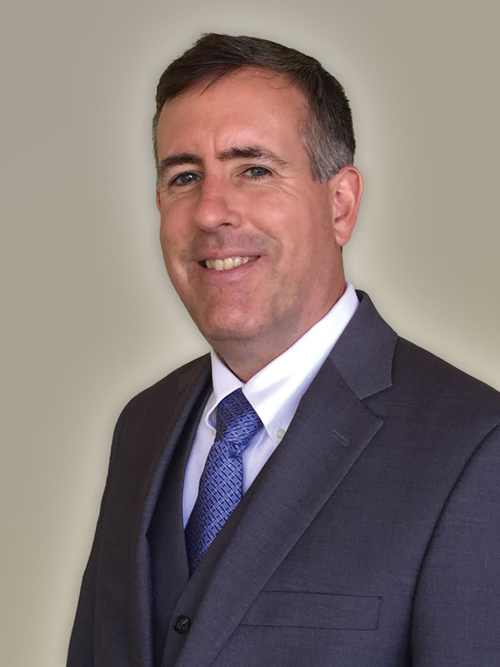 Jeff was most recently the president and CEO for North American Operations at Index, another leading machine tool builder. Jeff held that position for nine years. 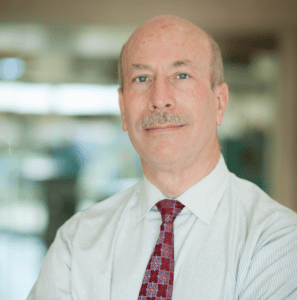 While at Index, he nearly doubled the sales of the company, reorganized the service, parts and training departments, plus opened a new office in the emerging Mexican market for the company. He was also previously the president of Machine Tools of Indiana, a dealer company he founded in 2001 and ran successfully for seven years. Jeff attended Vincennes University, Valparaiso University and Purdue, where he studied electrical & mechanical engineering. In commenting on his new position, he observes, “Schütte has a solid reputation as a builder of top quality, multi-spindle machine tools and, based on that foundation, we plan to accelerate the company’s growth curve to take us into more markets with a decidedly aggressive posture, including greater visibility in the media, at shows and through industry association participation. Complementing this sales growth strategy will be a buildup in our service, engineering and customer support programs.” Jeff also noted the long-range plans for Shütte include upgrades to the current facility in Jackson, Michigan, with more machines on the floor for demonstration of the company’s capabilities, testing and production scenarios for enhancing the customer experience.